This is a photograph of Benjamin Franklin Simpson who served as Kansas Attorney General from December 6, 1859 to February to July 1861 when he resigned the position to enlist in the army. 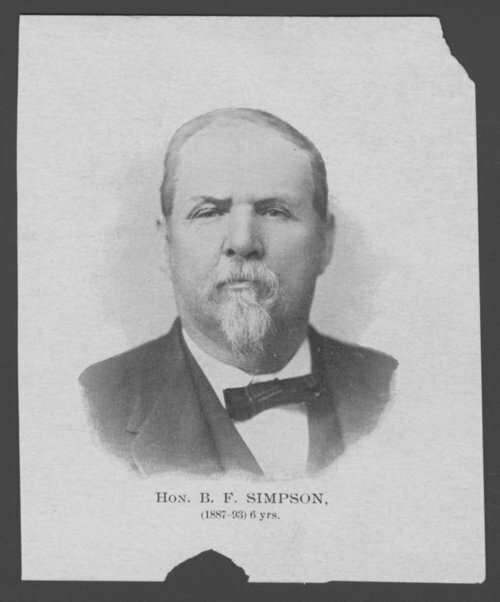 Simpson served as captain of Co. C, 15th Kansas Cavalry, throughout the Civil War and was promoted to major on June 7, 1865. He was active in the Republican Party and elected to several terms in the state legislature (both the house and the senate), serving as speaker of the house for the 1871 session. He was appointed United States marshal for the District of Kansas in 1878 and served until 1886. Later, he was appointed supreme court commissioner and served from March 5, 1887, to March 1, 1893. He died in Paola on August 10, 1916.